This page addresses how to record audio for qualitative research. The focus is on equipment and tips for its best use. Audiotranskription.de, a German commercial site with fine information and product tips, is worth checking out too. Transcom offers a comparison review - thanks to Alan Stockdale for this tip. 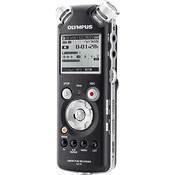 Note: If you are buying new equipment strongly consider a hard drive or "flash" recorder - for better sound quality, smaller size, long battery life and ease in exporting audio files to computer or for transcription. These are much better than cassettes or mini-discs if you plan to use the sound files directly, without transcription, or both transcribe and use the audio directly. Still, mini-disk or cassettes can do a fine job, too. Don't invest in new equipment unless you need too. HARD DRIVE AND FLASH RECORDERS: "The State of the Art"
Several hard drive and "flash" recorders can be used to directly record audio to computer file. The audio file is saved on disk for later transfer to computer or sharing with colleagues. Thus you can use them for transcription or directly as sound files with no extra work to change computer file formats. (Cassettes have to be converted to electronic files to use on computer. This is a "real time " process, so an hour of tape takes an hour to convert.) The quality of these machines is generally excellent. Do note, however, that an external microphone of high quality is still needed in some situations. File Formats: Be careful to chose a recorder that creates widely used file formats like .wav, .mp3 or .wma. Some recorders, like many Sony and Olympus products save to proprietary formats that are difficult to share with transcriptionists and colleagues. I would suggest you avoid them - thought they can be fine for simple recording and professional transcription. The drawbacks become apparent with data analysis software and presentation software from different makers. Edirol/Roland R-09 ($400 from Sweetwater.com) This digital recorder is small in size (4 inches x 2.5 x 1.1) and light in weight (6 oz). It uses SD memory chips up to 2 GB in capacity (a small 64MB is included with the unit). It records to .wav or mp3 file formats (mp3 up to 320kbps), 16 or 24 bit recording quality 44.1, 48kHz. It records in stereo or in mono. All this means the sound quality is exceptional. Great signal to noise ratio. USB 1.1 or 2.0 file transfer by cable, or transfer using the SD card itself if your computer has a media reader. Built in excellent stereo microphones as well as inputs for an external stereo microphone. Outstanding quality for voice or music. Will record for 6 hours with AA battery power, has an AC adapter. Changing SD cards allows for unlimited recording potential. Some minor background hiss, but not a problem in my view. 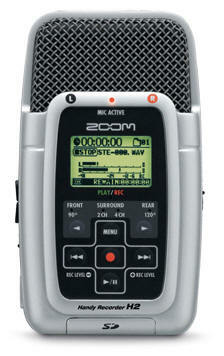 This digital recorder is larger than the Edirol (7.2 inches x 4.5 x 2.5) and heavier (18 oz). It records to Compact Flash chips or Microdisk drives. Native file format is .mp3 or PCM (128 kps .mp3 at 16 bit, 44.1., 48kHz). Easy USB 1.1 or 2.0 file transfer. The $700 PCM 670 is larger and has many more features, more options to vary recording quality. Changing CF cards allows for unlimited recording potential. 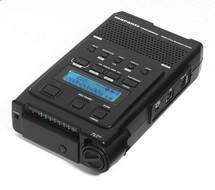 Handheld digital recorder with 2GB built in memory. Records to .wav or .mp3 file types, USB file transfer. Transcom.org reviews notes built in mikes are bright and sensitive to wind noise outside. 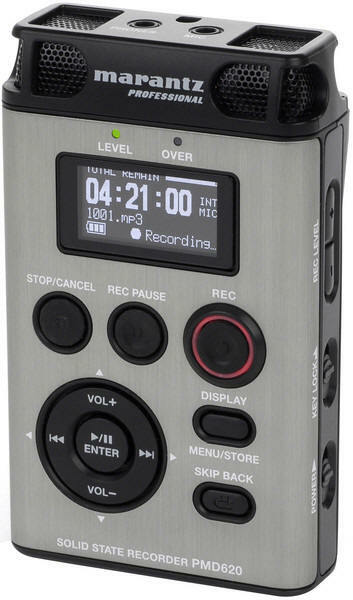 A smaller and less expensive recorder (4 inches x 1.5 x .5) with 512M internal flash memory. Records to .wma file format which is native to Windows but not always easy to convert to other formats (but has fine quality). The 310 has a high quality microphone and make very good recordings. USB file transfer. 15 hours recording time from 1 AAA battery. User/reviewers note that the internal speaker is very poor (don�t despair if what you hear from the internal speaker sounds awful!) - but the playback on better speakers is just fine. 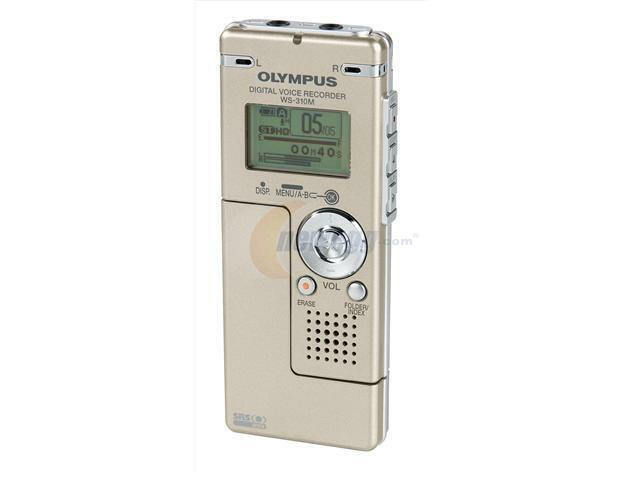 The less expensive Olympus WS-200 ($90 at Newegg.com) has 128M of internal flash memory and also records to .wma file format. USB file transfer Good recording quality. However, user reviewers note that the plastic body seems cheap; battery falls out unless taped in - but they note that the recording quality is quite good. I have used the iRiver iHP-140 for over two years. It has been great, but is discontinued. 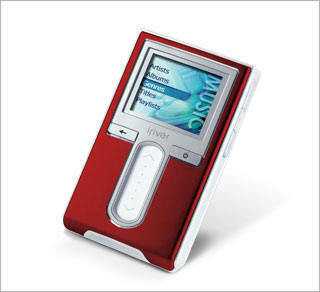 The current iRiver H10 or iRiver Lounge are comparable (both about $300). Both record mono in .mp3 or .wav formats at user defined quality levels (up to .mp3 @320 kbps). 90hz signal to noise ratio. Great internal mono microphone and sound quality (though not quite as good as the Creative products on output in my opinion). Can be used with an external mono microphone as well. Both are the size of a package of cigarettes and very light weight. User controls are easy to master. USB file transfer. Comes with an AC adapter and has a 15 hour plus battery run time. Some user/reviewers have had reliability concerns, player dies after a long or short time in use. Another hard drive based option I have used is the Creative Zen Micro Photo. This tiny recorder (3 inches x 2 x .7) has an 8GB hard drive and weighs 4 ounces. It sounds great on recording and playback (96 db signal to noise ratio). It records in .mp3, .wav, .wma and several other file formats. USB file transfer. The controls are sensitive to the point of annoyance but the results are worth learning them well. Records up to 15 hours on a built-in rechargeable battery which unfortunately has to be plugged in a computer USB port to recharge - a drawback if you are way out in the field. I have heard clocks ticking in quiet moments of recordings done in people's homes. An Apple IPod (not Mini or Nano) with a Dock Connector (except the mini) and either a $40 Griffin Technologies iTalk add on or a $50 Belkin iPod Voice Recorder can record directly to disk. Either attaches to the IPod through the remote/headphone connector, basically sitting on top of the iPod. Both are omnidriectional. Reviewers say the iTalk looks slicker and makes higher quality recordings. It also has a headphone jack pass through feature. The Belkin voice recorder attachment also includes a speaker for quick review as an alternative to carrying headphones. An LED shows recording status. 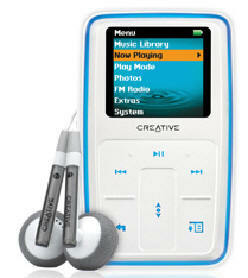 No special software is required beyond Ipod software version 2.1 or later. IPods are well known for easy connection to Macs via ITunes and also work with Windows XP or 2000 on PCs. NOTE WELL: With either attachment the IPod can record interviews to hard disk. The iPod has mono, low resolution sound recording capabilities, apparently to keep it from being used as a live music "bootleg" recorder. It is limited by Apple purposefully so the results are not as high quality as products like the Creative or the iRiver, but still quite useable for most spoken interaction purposes. But, it sure is cute! With flash media, you can remove the SD of CF chip and plug it into a reader (about $20) for direct import to the computer. Some even plug directly into a USB port. The chips are very small and can get lost. (I have lost one.) I suggest you box them in their plastic containers to make them more visible. These recorders are very reliable, too. Alas, they can fail. Once you copy the sound files to a computer, they are ready for transcription or coding as audio. Software like ATLAS can code .wav or .mp3 audio/music files directly without transcription. The main limitation: Make sure your transcriptionist can handle the file formats and chip types you are using. Mini-discs are basically small CDs. They offer fine quality but you need to change media every hour or so (and carry it with you)! I have used a Sony MZ-B100 Mini-disc recorder. It is about the size of a pack of cigarettes and has built in stereo microphones. (The stereo recording capability is unique.) The quality is great - none of the hiss you get with tapes. Batteries last for about 24 hours (but always have spares on hand!) 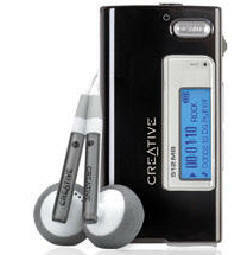 It records up to 74 minutes at highest quality up to 160 minutes mono, lower quality on a single mini-cd disc. Once recorded, you can then download the files (.wav format) to a computer, making the disc available for reuse. One drawback: the files size is large and may require conversion to a more compact format like .mp3 (especially if you plan to email it to a colleague). The MZ B-100 is quite easy to use. As with cassettes, always use the same brand of mini-disc. (The lubricants differ and this avoids problems.) They are also much cheaper to purchase in bulk. On some other minidisk or similar recorders you will need a plug in microphone. Be sure it is omnidirectional and of excellent quality. Pros and Cons: Small size, no external microphone is needed (for MZ B-100), sound quality is great, battery life excellent, but you have to change discs and perhaps file formats. Again, your transcriptionist may need a cassette in which case you much copy in real time to a cassette at lower quality (though your original is left in tact). CASSETTES (Fine, but higher fidelity options are available. Given costs of tapes, probably not an economical option anymore). Use only high grade tapes - ideally all of the same brand. Don't use cheap tapes or any longer than 90 minutes total. I use Maxell XLII 90 minute tapes. Purchase by the dozen or a ten pack they cost $1.00 to $1.25 each. (120 minute tapes seem like a good idea but the tape is very thin and most portable machines can't turn the weight of the tape very well, reducing recording quality if they work at all). Tapes differ in lubricants, it is best to use the same brand once you find one that is fully satisfactory. Also, don't re-use tapes - the original is needed for potential audit and recording quality suffers when tapes are re-used. You get what you pay for. The over $150 dollar ones really sound much better. (Check with your university Audio-Visual staff.) A weighted base/stand and a 6 foot or more cable length are also good. Many have mini jacks with converters that allow direct plug into a computer vua USB. The Sound Professionals Omnidirectional dual mono microphone SP-HHM-1 with a weighted base works very well. For the Creative Zen Nano Plus consider a mono mini mike; Such as the Sound Professionals Mini Mono Omnidirectional ($35) wired for dual mono. This tiny mike plugs directly into a mini jack and sticks out of the recorder. omni-directional for most research work. Unidirectional microphones will not get you and the other person well. Be sure the plugs fit your recorder (inexpensive recorders use min plugs (like headphones) but better microphones may have different sized jacks. Many methods can meet your needs!